KoopaTV: The True Spirit of Justice — Not On Mobile! By LUDWIG VON KOOPA - Spirit of Justice going to mobile makes a certain Nintendo announcement even more FAKE NEWS. Today, CAPCOM released Phoenix Wright: Ace Attorney — Spirit of Justice on Apple and Google's mobile store platforms. Spirit of Justice enjoyed a slightly over one-year exclusivity period on the Nintendo 3DS, where I'm pretty sure it did well. I've covered all of the other times an Ace Attorney game has been ported to mobile systems (see below the footer for those articles — there are a lot of them now!) while KoopaTV has been established (so not Ace Attorney Trilogy on mobile). I don't really want to focus on how upset I am about this announcement or how much I dislike mobile gaming. Instead, I want to connect this article to the one I wrote last week about the September 13 Nintendo Direct and how Nintendo's claims about the ported Apollo Justice: Ace Attorney were FAKE NEWS. But, first, some details on these mobile versions are in order just so we can have some baseline on their badness. Interestingly, they differ between iOS and Android. On Android, the game is a straight-up $20 for everything, which includes the bonus case and costumes. That's a good deal. The least Phoenix Wright: Ace Attorney — Spirit of Justice has cost on Nintendo 3DS was $17.99. That didn't include DLC, which doesn't get a price cut when the main game goes on sale. According to RawkHawk2010's testimony, however, playing Ace Attorney games on a tablet is a much worse experience than playing on a Nintendo 3DS. The only benefit mobile has (besides being slightly cheaper — which is a bad thing when the objective is to give CAPCOM as much Ace Attorney-related revenue as possible) is that you can get screenshots of your gameplay after November 8th. 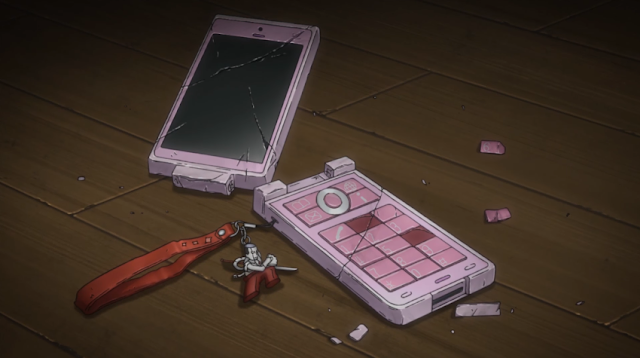 Hey, if you snap the top-half of a 2028 flip-phone, it sort of looks like the iPhone X! You get to buy the first episode of Phoenix Wright: Ace Attorney — Spirit of Justice for $.99 on the Apple app store, and then you can buy the rest of the game in piecemeal or as a bundle, but if your purchases overlap you don't get a refund. The Main Story Set (episodes 2–5) is $14.99, and the Special Episode is $2.99. I don't know what the other prices are because Apple doesn't want to make that public. I highly recommend not doing any purchases with Apple, and recommend not doing them with Google. Just buy the game with your Nintendo 3DS. Now... the FAKE NEWS component. Spirit of Justice on mobile just came out a week later. By all indications, if a port of Apollo Justice: Ace Attorney is “new” and the “next game” in a series, then a port of Phoenix Wright: Ace Attorney — Spirit of Justice is also new, and lays claim to being the “next game” much more than the Nintendo 3DS port of Apollo Justice. Let's hope that seven second bit doesn't turn out to somehow even be MORE fake in the next two months! But we'll keep you informed if it does. Ludwig railed against Phoenix Wright: Ace Attorney — Dual Destinies coming to mobile systems. ...But he could see why CAPCOM would want to port Dual Destinies. More recently, CAPCOM ported Apollo Justice: Ace Attorney to mobile devices before it did with the 3DS. Nintendo gave up on FAKE NEWS and decided to just censor the game instead. Apollo Justice: Ace Attorney specifically comes out November 21. Not even three months later, and yet another Ace Attorney game, Investigations, gets ported to mobile. Simple point and click games work well on most mobile devices, but most consumers are not willing to spend $20 on a gaming app. Considering a great majority of fans of the series have already played the game on the 3DS, unless some want to double dip, who is going to purchase it? Can't say CAPCOM doesn't listen to their fans?